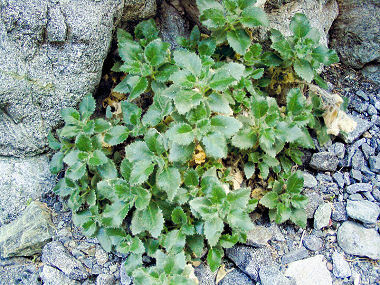 Desert Rocknettle is a member of the Loasa Family. It forms round, bushy clumps and grows to 12 inches in height. 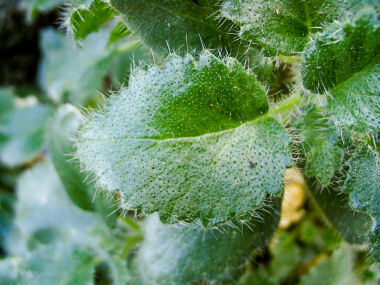 It has coarsely serrated leaves with stinging hairs which grow to 2.5 inches in length. It grows in the Mohave Desert on cliffs and rocky slopes, and in canyon washes below 4000 feet in elevation. The leaves of the Desert Rocknettle stick readily to clothing, and are very difficult to remove without crushing them into a green mush. Desert Rocknettle blooms between March - May and produces cream or pale yellow flowers with 5 petals to 2 inches in length.